Friday night football has been the small town staple in Pikeville, with a population of about 700, since the 1960s. Whether its with their halftime hotdogs, ice cream truck, the little league team throwing the pigskin behind the bleachers, or the spirit of the Golden Falcon will always bring an unrelenting spirit to the town despite winning or losing. Preparing to kick off C.B. 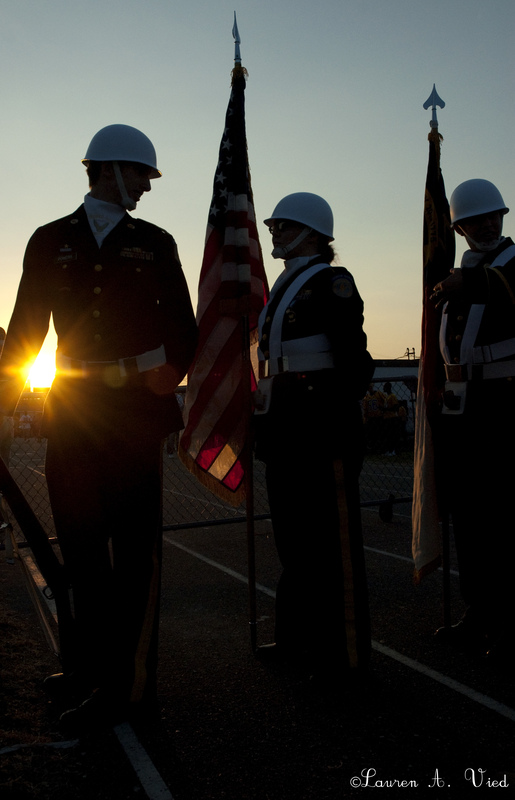 Aycock's first home football game at Hardy Talton Stadium September 3, John Powers, 11th grade, turns to talk to his fellow color guard and classmate, Jamme Hines. 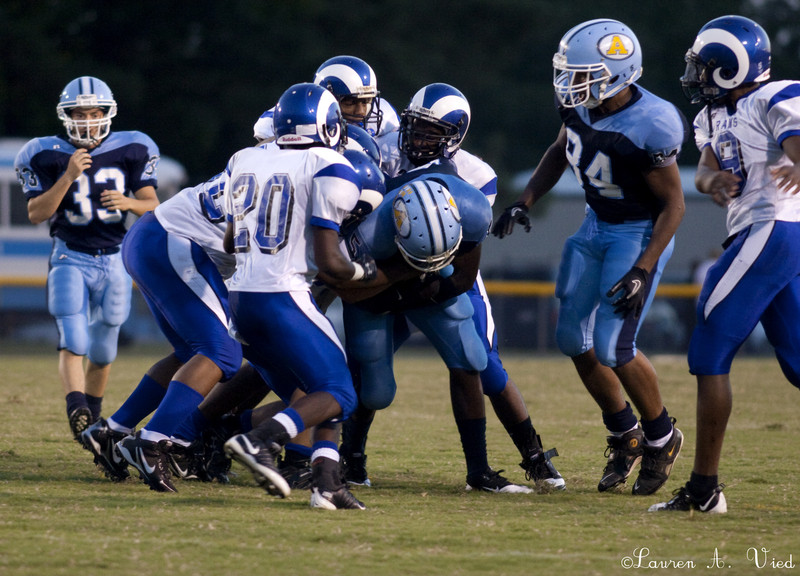 The defensive line of Greene Central High School holds back Craig Murdock, 5, of the Golden Falcons. At halftime, the Golden falcons were down 21-0. 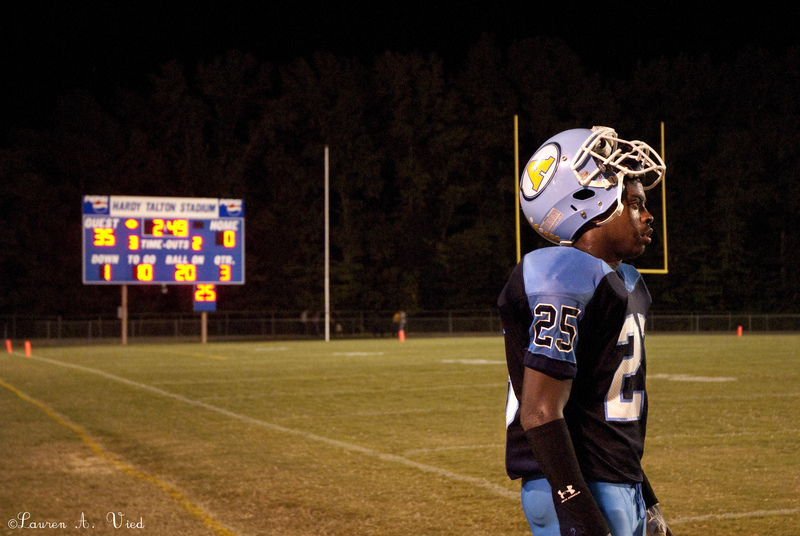 After an intense play on the gridiron, Elijah Murray, 25, watches his team on the field. 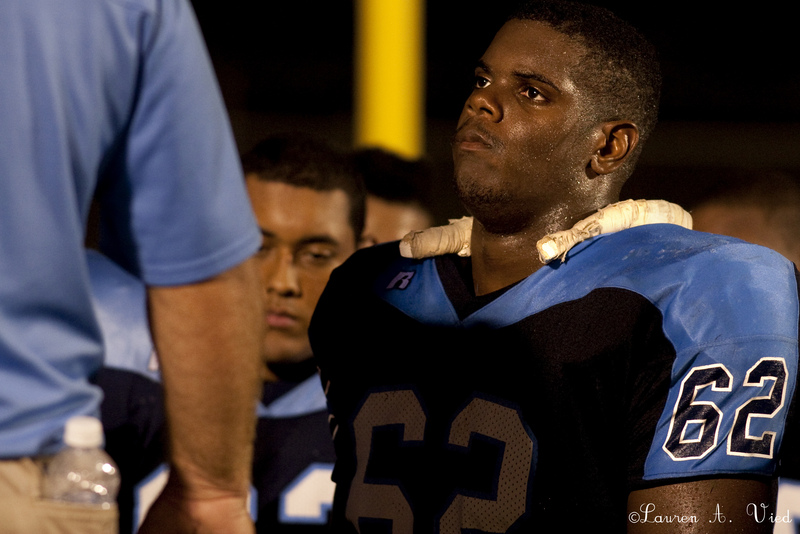 A fan on the sidelines said he was "very disappointed" in how the Golden Falcons were playing that night. 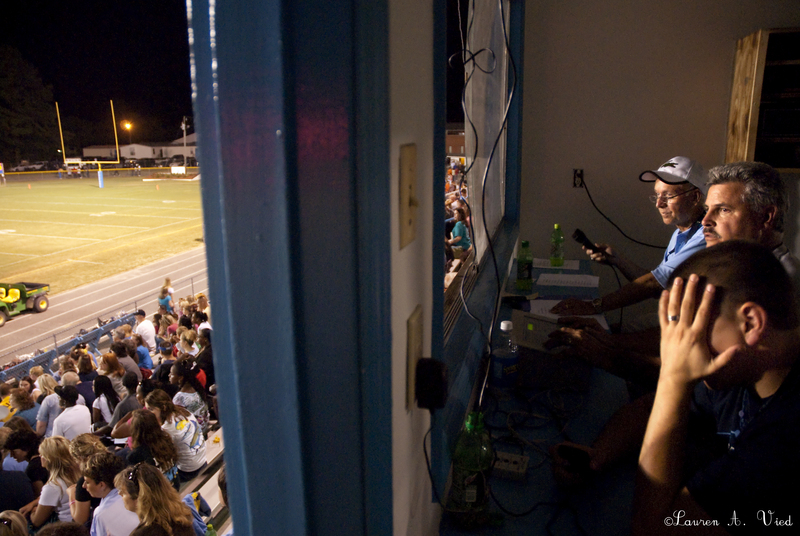 Since the 1970s, Luke Vail has announced most football games at C.B. Aycock. Chuck Covar runs the scoreboard as Josh Overton reacts to a play by the Golden Falcons. The game, which was uneventful, kept the fans fairly subdued throughout the night, unless the cheerleaders were throwing out plastic footballs. Marching band members Casey Scarboro, Bailey Daniels, Alex Vanmeir, Christy Spears, Jessica Hensley talk about their halftime performance of Jerry Lee Lewis' "Great Balls of Fire," who their new crush is, and about their friends while sitting on the back end of the band booster club's ice cream truck. The ice cream truck makes homemade ice cream and the funds go to help the band compete. Captain Jarrod James, 12th grade, listens to head coach, Randy Pinkowski, after the Golden falcons loss of his team's first home game. "We will keep working until we get our swagger back," Pinkowski said to his team. "Now go find yourself a honey and go home." 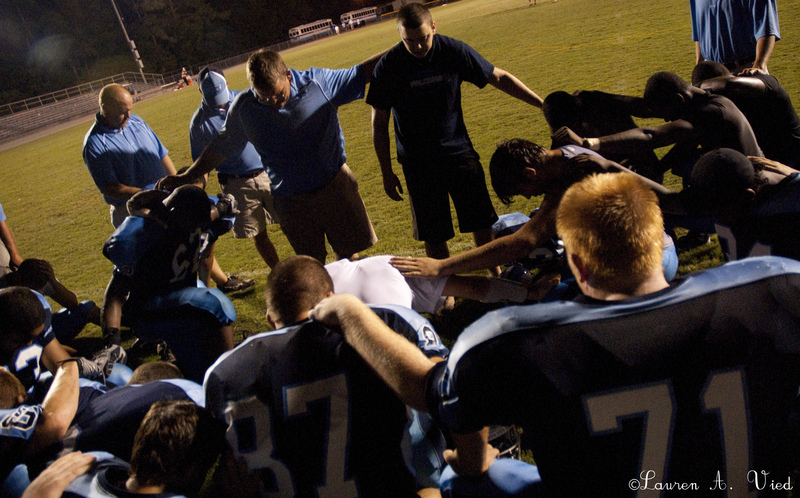 Josh Overton of Fellowship of Christian Athletes leads a team prayer after the game in hopes of keeping their faith in their game and their religion.